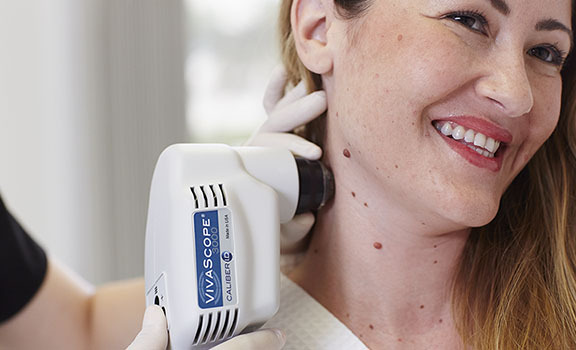 The VIVASCOPE® 3000 is a handheld confocal imaging system designed to display, capture and store high resolution cellular-level images of skin. 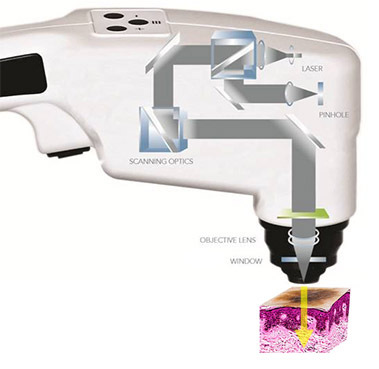 This imaging tool allows the operator to freely navigate the device across the skin while delivering stable, repeatable, high quality cellular-resolution images of epithelium of the skin and supporting stroma. 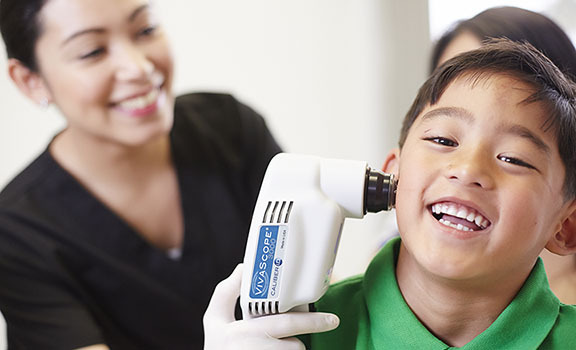 The VIVASCOPE 3000 is capable of imaging cells in the epidermis of the skin and fibrous tissue, primarily collagen and fibrin, in the dermis. Additionally, the VIVASCOPE 3000 makes it possible to visualize circulation of blood cells, including erythrocytes and leukocytes, in capillaries and other small vessels in the epithelium and the supporting stroma. For more information about confocal imaging, click here. 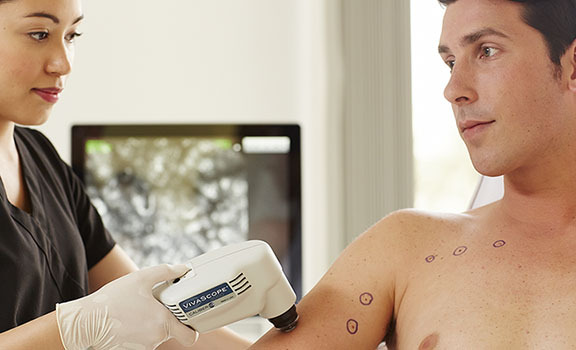 The VIVASCOPE 3000 generates single images of skin that are parallel to the surface or on the “horizontal plane” . 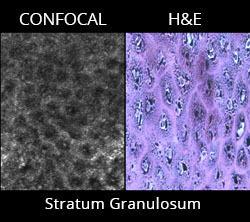 The position of the single image inside the skin can be changed by moving the objective lens up, down or laterally, relative to the skin surface. A series of horizontal images captured while scanning laterally (”deep” or Z) into the the skin. 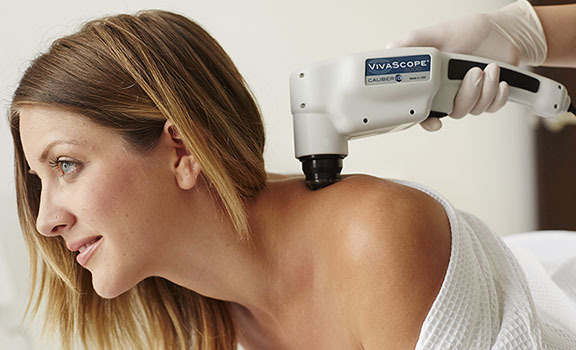 The images are captured by moving the objective lens of the VIVASCOPE 3000 up and down so that it can capture images at different horizontal depths within the skin. 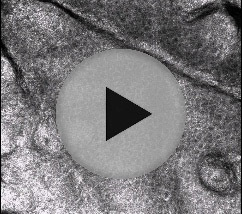 The video capture software module makes it possible to save entire image sequences of confocal images in the form of video. Video captures are stored as AVI movies and users can also view and edit images and videos outside of the VIVASCOPE application. Caliber Imaging & Diagnostics, Inc. The VIVASCOPE system is intended to acquire, store, retrieve, display and transfer invivo images of tissue, including blood, collagen and pigment, in exposed unstained epithelium and the supporting stroma for review by physicians to assist in forming a clinical judgement. ©2017 Caliber Imaging and Diagnosis. Caliber I.D. Inc., VivaScope, VivaNet, and VivaCam are registered trademarks of Caliber I.D. Inc., or its subsidiaries and affiliated companies.